Present day Nelson County was included in Henrico County, one of the eight original shires or counties formed in Virginia in 1634. In 1728, Goochland County was formed from Henrico and in 1744 Albemarle County was formed from Goochland. 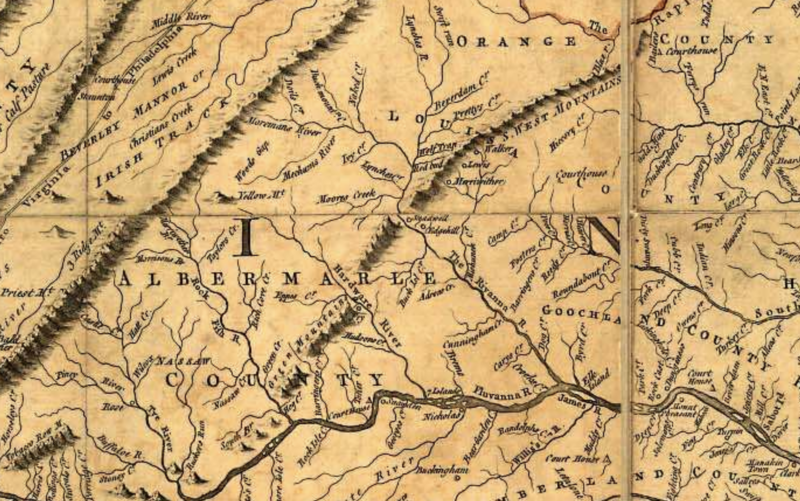 In 1761, Amherst and Buckingham counties broke away from Albemarle. The capital of Amherst County at that time was located in Cabellsville (near present day Colleen). On 1 Jun 1808, Nelson was formed from Amherst County. The county was named for Thomas Nelson Jr., the third Governor of Virginia and one of the signers of the Declaration of Independence. In the heyday of the river economy, during the 19th century, Nelson County flourished with its apple crop, logging mills, chestnut wood and nuts. The turn of the century was the economic high point for Nelson County, after which the economy fell drastically. The widespread use of the automobile and the building of roads decimated the river business. William Cabell Rives (1792-1868) - U.S. Senator, member of Peace Convention of 1861 and Confederate Congress.